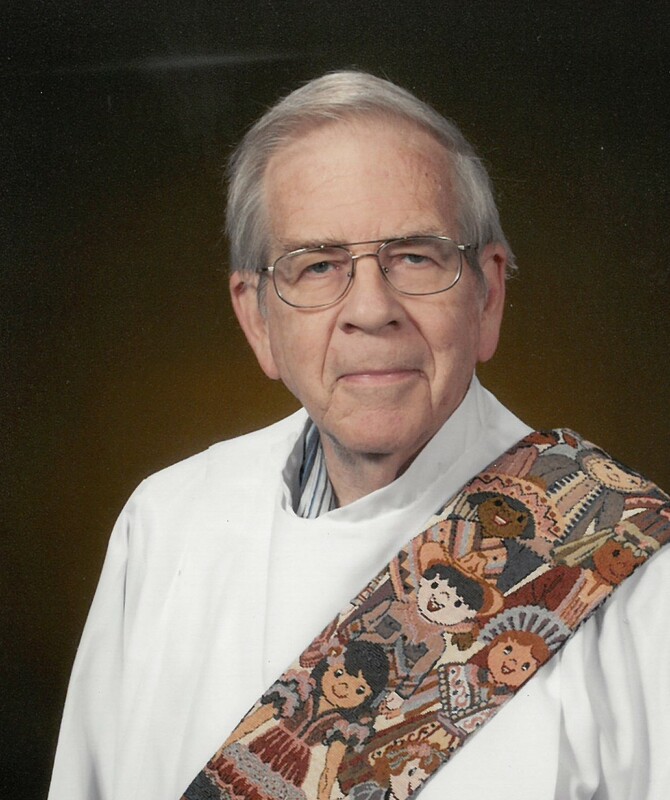 Deacon Thomas “Tom” Craig, age 75, of Gladstone passed away on Wednesday, November 21, 2018 at the Bishop Noa Home in Escanaba. Tom was born January 23, 1943 in Chicago, Illinois, the son of Bernard and Marie (Tomanek) Craig. He was united in marriage to Diane Helen Urban on June 25, 1966 in Chicago, Illinois. Tom attended the Quigley Preperatory Seminar in Chicago, Saint Mary’s University in Winona, Minnesota, and Loyola University. He was ordained at the St. Francis Xavier Cathedral in Green Bay and served at Sacred Heart in Marinette, WI, St. Michael in Perronville, MI, St. Pius X in Appleton, WI, St. James in White Lake, WI and St. Martin in Cecil, WI. He was a member of All Saints Catholic Church in Gladstone. Tom is survived by his son, Michael (Julie) Craig of Ann Arbor, MI; two daughters, Laura (Bill) Young of Gladstone and Megan Craig of Minneaoplis, MN; two grandchildren Jonathan (fiancee RaeAnn Tourangeau) Young and Jessica (fiance Derek Bernson) Young; brother, Robert Craig of Illinois and a sister, Sr. Kathleen Craig of Illinois. He was preceded in death by his wife, Diane, his parents, Bernard and Marie and a brother, Fr. Larry Craig. The family will receive friends on Monday, November 26 from 3:30 PM to 5:30 PM at the Skradski Funeral Home in Gladstone. Mass of Christian Burial will be at 6:00 PM at All Saints Catholic Church in Gladstone with the Most Reverent John Doerfler officiating. A luncheon will be served in the parish hall. Tom will be laid to rest in the St. James Cemetery in White Lake, Wisconsin. In honor of Tom, in lieu of flowers, please make a donation to your local food bank. Our love, prayers and hugs to you all. Deacon Tom will always be in our hearts. May God have Mercy on his soul and welcome him into heaven. Our deepest sympathy and condolences on the passing of our dear cousin Tom. He was the wind beneath your wings. While the hole in your hearts may never completely heal, thinking of his smile and laughter may assuage some of the pain. Celebrate his journey’s end; a good and faithful servant. Requiescat in pace forevermore. We were deeply saddened to learn of the passing of our cousin Tom to eternal life and ask our cousins Kathy and Bob to accept our condolences. It was an honor and a joy to have Tom as a member of our family and we are very proud of the valuable service he has given to the church. May the eternal light shine upon him. May Tom be Embraced by ABBA, As His beloved son in Christ Jesus, see the Glory Of His Face, and Join the Heavenly Choirs, Who Sing Praise & Thanksgiving In the Everlasting Life Of Perfect Joy at the Sight Of The Beautious Love Of The Trinity. Sending my love to Laura, Michael, Megan, Bob and Kathy at this saddest of times. Tom was a wonderful man and I know he will be missed by many but of course most of all by his family. My thoughts and prayers are with you all. I was a teenager in White Lake when Deacon Tom (or Deakey as I called him) was our parish director. I was so sorry to hear of his passing. While I hadn’t kept in touch in recent years, Deacon Tom had a very profound effect on my upbringing and on my faith. He spent time with me and counseled me during a very confusing and trying time in any young person’s life. I will be forever grateful to him and to God for bringing him to me at the time in my life when I needed him most. His cynicism, dry sense of humor, wit, and sarcasm made him the ultimate youth leader. He encouraged me to pursue a relationship with Jesus Christ and since then that relationship has grown immensely. I owe a debt of gratitude to him and to your family for sharing him with us. He was a wonderful man. I’m thankful he is with his savior and in pain no more. Love and hugs! My sympathy to all of you. I worked with Deacon Tom at St. James/St. Stanislaus Parish in White Lake/ Langlade. He was an amazing man. Tom had young families with their children coming back to church. He would have the children come up front to listen to his homily. It was great. He got involved in the community, started the Christian Food Pantry and had a volleyball court made outside the rectory. He would have the CCD kids do Christmas plays and involved them in the Ecumenical Prayer Services. I haven’t heard from him after he left Cecil but I always reflected back on him in conversation. To many memories to list. Again, my deepest sympathy to you all. God Bless! Our hearts go out to all of you with deepest sympathy. We had the privilege of getting to know your dad a little bit when we’d visit Bishop Noa Home. Visiting your dad and his table mates (Hazel and Frank) brought us many smiles. We discovered very quickly that Tom was a very intelligent man with a very keen and dry sense of humor. Sitting next to your dad, Hazel and Frank brought more joy to us (than we could have ever given to them). I also had the pleasure of sitting in on your dad’s presentation on Ireland. It was great. Your dad was such a “pro”. We also enjoyed discussing the Chicago Bears when they played the Green Bay Packers. We knew which team your dad was cheering for … and it wasn’t Green Bay! We will remember your dad and his easy smile with much fondness. God bless and watch over all of you during this very difficult time.